Your donations are what fund all of our FREE programs nationwide! If you are interested in donating to our organization, please click on the button below. 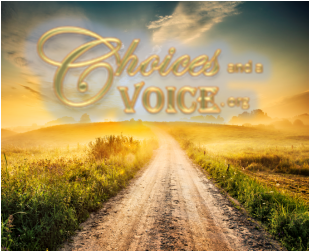 Choices and a Voice is a division of Christian Outreach Ministries. Our organization's goal is to INSPIRE in you a love for Jesus Christ, and a passion for righteousness; help EMPOWER you to have grace and forgiveness toward others as well as yourself; ENCOURAGE you to choose joy and laughter, embrace who you are in Christ, pursue your dreams, set realistic goals, choose wisely, implement virtues, take calculated risks, set healthy boundaries, build on your God-given strengths, and find your life’s purpose; EQUIP you to reach your full potential; DISCIPLE you into a deeper relationship with God and bring God's healing love to you so you can share it to a broken and hurting world. Most of all we want to WALK with you and HELP you enjoy your life’s journey by taking baby steps toward joy one day at a time! Do you need some excitement in your life along with laughter and exercise? WooHoomba is FUN freestyle fitness! Go all-out crazy or stay on the conservative side! Don't worry about learning complex dance routines, because there isn't any! We dance (our own creative moves) to all kinds of music including Christian praise/rock! Everyone moves to their own style, preference and creativity! Wear your sneakers, cowboy boots, flip-flops or slippers! WooHoomba is not about looking good, it's about laughing and having fun! WooHoomba is for all ages 1-101! Choose your style from country to kickboxing! Add some aerobics, a little ballet and salsa or create some crazy dance moves and give them a name! We say "the crazier the better!" One thing for sure is you'll be laughing and leave smiling! Contact us to join a class or start a WooHoomba class at your local church! Who said church isn't fun??? Get involved in our Men & Women's Mentoring Program, !ENCOURAGE! Do you need a mentor or would you like to become a mentor? After completing a Journey to Joy class, your small group can choose to stay connected through our !ENCOURAGE! Mentoring Program. Contact us for additional information! World-wide we raise funds for orphans, through our Korea Campaign in which volunteers go on our mission trips and we purchase basic-need supplies to bless orphans. If you are interested in joining us on one of our mission trips, you can contact us for more information! Journey to Joy is a Friendship Group for Men and Women who desire to or need help choosing joy in the midst of life's difficulties. Could you or someone you know benefit from a Journey to Joy Friendship Support Group? If so, contact us and we will get you connected with a Journey to Joy group near you. These classes are offered for men and women of all ages and backgrounds at various community centers and churches of all denominations. Do you desire to live a joyful abundant life in Christ?Would you be interested in mentoring a small group of women in a Journey to Joy Friendship Group at your local church? Would you like to volunteer to become trained and start a Journey to Joy Friendship Group in your local church? If this is your desire, contact us so we can help you get started! Are you lacking joy, laughter, fun, positive, encouraging and healthy friendships in your life? !ENCOURAGE! Men and Women's Mentoring Program to help you along your life's journey. God wants to be your refuge and strength. Jeremiah 29:11 says, For I know the plans I have for you, __(insert your name)__ declares the LORD, “plans to prosper you and not to harm you, plans to give you hope and a future. Joy vs. happiness - Joy is not the same as happiness. Usually happiness is a result of something external (we can have happiness by taking exciting vacations, buying new things, spending time with friends, etc). But joy is internal. It is not a feeling or emotion, but an inner state of being when we are connected to God through His Holy Spirit.